"Chang (beer)" redirects here. For the Tibetan beverage, see Chhaang. Thai Beverage, better known as ThaiBev (Thai: ไทยเบฟ) (SGX: Y92), is Thailand's largest and one of Southeast Asia's largest beverage companies, with distilleries in Thailand, Scotland, and China. Listed on the Singapore Stock Exchange, Thai Beverage Plc has a market capitalization in excess of US$13 billion. ThaiBev brews Chang (or Chang Beer) (Thai: เบียร์ช้าง), a pale lager. "Chang" (Thai: ช้าง) is the Thai word for elephant, an animal of cultural and historical significance in Thailand. The logo depicts two elephants face-to-face. In 2006, the company launched Chang Light, 4.2 percent ABV and Chang Draught in bottles at five percent ABV. They were discontinued in 2015. In 2015, ThaiBev celebrated its 20th anniversary Chang Beer. For this occasion, ThaiBev consolidated all Chang brands in Chang Classic. ThaiBev stopped production of Chang Light, Chang Draught, and Chang Export. In addition, the new bottle was introduced in emerald green. Production of Chang Classic is shared between ThaiBev's three breweries. The recipe was changed to include rice, previously only used in the domestic 6.4 percent version. Its ABV in Thailand is 5.0 (Currently 2018). ThaiBev's flagship brand Chang Beer won a gold quality award three times in the beers, water, and soft drinks category at the World Quality Selections 2018, organized each year by Monde Selection. In 2004, the company introduced Archa (Thai: อาชา 'horse') beer, at 5.4 percent ABV. Archa won a gold medal at the 2007 Australian International Beer Awards (AIBA). The ABV was lowered to five percent in 2014. The first market outside Thailand to distribute Archa Beer was Singapore, where it was successfully launched in 2012 by InterBev (Singapore) Ltd.
Federbräu is a German-inspired quality beer brewed using the imported German malt. Using only a single source of German malt in the brewing process. Federbräu is five percent alcohol by volume. In December 2000, Carlsberg and Chang established a 50–50 joint venture, Carlsberg Asia, to create a significant brewing company in Asia. The Carlsberg influence can be seen in the typography of the "Beer Chang" logo, which resembles the classic "Carlsberg Beer". In 2005, Carlsberg pulled out of the venture and terminated its licence agreement with Chang due to non-fulfillment of contractual obligations, resulting in Chang claiming US$2.5 billion in damages. A final settlement of US$120 million was subsequently paid by Carlsberg. ThaiBev bought a majority of shares in Sabeco in 2018 for 4.8 billion US dollars. Sabeco owns leading beer brands in Vietnam including Saigon Beer and 333. At the time of the acquisition, Sabeco's Vietnam market share had fallen below 40 percent. ThaiBev produces brown and white spirits, including rum. ThaiBev's most famous, but not best selling, spirit is Mekhong, which originated in 1941 at the Bangyikhan Distillery west of Bangkok. Originally a state-owned distillery, it dates back over 200 years to the beginning of the current Chakri Dynasty. The launch of Mekhong (a rum with added rice) was aimed at producing a high-quality Thai spirit to stem the increase in the import of foreign liquor and to eventually replace imported brands. SangSom (rum), however, has been the country's most popular spirit brand for over 29 years, until 2006 holding almost 50 percent share of the entire brown spirits market in Thailand. The company also produces Mungkorn Thong and Hong Thong and brands based on whisky, such as Crown 99 and Blue, as well as Scotch whisky brands such as Hankey Banister and Pinwinnie Royal Scotch Whisky. White spirits are made from molasses without any mixture or colour, and produced in four alcohol contents: 28, 30, 35, and 40 percent. The company's largest-selling white spirits is Ruang Khao. The labels are colour-coded to reflect the alcoholic strength but do not have the brand name printed on them. Other brands in this category are Niyomthai and White Tiger. Molasses are the main raw material used for the production of ThaiBev's spirits, so that most of the products fall under the category of rum. As is the case with all distilled spirits, the distillate is crystal clear when first distilled. Amber and dark brown spirits obtain their colour from the extracts from the oak barrel during aging and from caramel, a natural colouring agent. ThaiBev's yeast cultures, used for fermentation, are grown in its own laboratory and propagated in a yeast propagation tank. The yeast, molasses diluted by water, steamed rice that has been sprayed with mould (to create sugar) and incubated for four days, and water are added into a fermenter and the mixture is allowed to ferment for approximately 72 hours. The liquid that is left at the end of the fermentation process is known as fermented mash. Distillation takes place in a distilling column and a pot still, which is a large copper or stainless steel kettle. Distilling involves boiling the "fermented mash" and condensing its vapour. The spent sludge remaining in the pot still is removed to be processed. The company's white spirits are then diluted with demineralized water to the desired alcohol content in a white spirits blending tank and sent to be packaged and bottled after filtering. Brown spirits are diluted with demineralized water and then aged in oak barrels for three to eight years depending on the brand. The aged alcohol is then further diluted with demineralized water before bottling. Liquor concentrate alcohol and caramel color are added. The brown spirits are passed through filters and then bottled and packaged. ThaiBev also makes Chinese herb spirits, branded as Chiang-Chun and Sua Dum. These are produced by blending alcohol, white spirits, sugar, caramel, and Chinese herbs, and then further diluting the mixture with demineralized water. 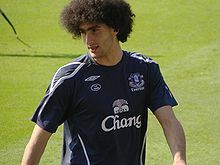 In 2004, Chang became the sponsor of Everton Football Club of the English Premier League. Together, they initiated five projects in the aftermath of the tsunami disaster in Thailand. Everton-Chang is a village on the Khao Lak coast in Phang Nga Province of Thailand. It consists of 50 houses and a football field. It was built following the 2004 tsunami that struck the area and destroyed the existing village of Ban Naan Khem. Local youth teams compete for the Chang-Everton cup. Officials from Everton F.C. and Chang Beer have been involved in the project. Together, they sponsor Chang Everton Football Cup and send promising Thai footballers to Liverpool for a trial with Everton. In 2005, ThaiBev became the subject of nationwide criticism in Thailand by the Buddhist monastic community and other religious groups. At the time, Thai Beverage had announced its intent to list publicly on the Stock Exchange of Thailand (SET), which would be the biggest listing in Thai history. Despite attempts by the National Office of Buddhism (a government agency) to prohibit monks from protesting, 2,000 monks from Wat Phra Dhammakaya organized chants of Buddhist texts in front of the Stock Exchange to halt Thai Beverage's IPO. [note 1] In an unprecedented cooperative effort, the temple was joined by former Black May revolt leader Chamlong Srimuang and the Santi Asoke movement. Subsequently, another 122 religious and social organizations joined the opposition, reaching numbers of 10,000 protesters. The organizations asked Prime Minister Thaksin Shinawatra's cooperation to stop the company, in what some of the protest leaders described as "a grave threat to the health and culture" of Thai society. While SET pointed out the economic benefits of the listing, opponents referred to rising alcohol abuse in Thai society, ranking fifth in alcohol consumption according to the UN Food and Agriculture Organization. Ultimately, the protests led to an indefinite postponement of the listing by the exchange. Thai Beverage chose to list in Singapore instead, as the Thai Stock Exchange chief resigned as a result. ^ The temple used the project name "Thai Buddhist Monks National Coordination Center". ^ "About Us". ThaiBev. Retrieved 10 August 2015. ^ a b c ThaiBev Annual Report 2015. Bangkok. 2015. ^ Khettiya Jittapong (22 January 2013). "Thai billionaire Charoen Sirivadhanabhakdi builds empire with F&N takeover". Reuters. ^ Head, Jonathan (3 February 2013). "Thai whiskey tycoon Charoen Sirivadhanabhakdi takes over Fraser and Neave". BBC News. Archived from the original on 2013-02-04. ^ Kwanchai Rungfapaisarn (21 August 2015). 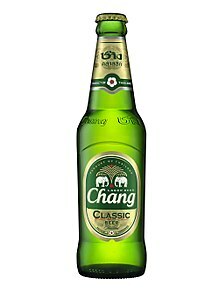 "ThaiBev consolidates all beers into Chang Classic to shake up market". The Nation. ^ "Chang Beer". ThaiBev. Retrieved 5 January 2018. ^ "Archa Beer". ThaiBev. Retrieved 5 January 2018. ^ "Federbräu Beer". ThaiBev. Retrieved 5 January 2018. ^ Hills, Jonathan (5 April 2005). "CSR and the alcohol industry: a case study from Thailand". CSR Asia. Archived from the original on 29 November 2016. Retrieved 29 November 2016. ^ Kazmin, Amy (19 March 2005). "Buddhist monks protest against IPO plan". The Financial Times. Archived from the original on 31 August 2016. ^ a b Inbaraj, Sonny (20 March 2005). "Thailand: Beer and Buddhism, a Definite No, Cry Conservatives". Inter Press Service. Retrieved 29 November 2016. ^ a b c ขบวนการต้านน้ำเมา ร้อยบุปผาบานพร้อมพรัก ร้อยสำนักประชันเพื่อใคร? [Resistance against alcohol: a hundred flowers bloom fully, and for who do a hundred institutions compete?]. Nation Weekend (in Thai). The Nation Group. 4 March 2005. Retrieved 28 November 2016. ^ "Buddhists protest beer company's launch on stock exchange". Associated Press. 20 July 2005. Retrieved 9 July 2017. ^ "Protests 'halt' Thai beer listing". BBC. 23 March 2005. Retrieved 29 November 2016. ^ "5,000 Buddhists protest against listing breweries on Thai exchange". Today Online. Agence France-Presse. 20 July 2005. Retrieved 29 November 2016 – via The Buddhist Channel. ^ Kazmin, Amy (4 January 2006). "Thai Beverage listing moves to Singapore". The Financial Times. Archived from the original on 4 July 2017. ^ "Thai Bourse Chief Quits After Losing I.P.O. to a Rival". Financial Times. 25 May 2006. Retrieved 29 November 2016 – via New York Times. This page was last edited on 25 March 2019, at 12:39 (UTC).